A full service restaurant featuring hearty breakfasts, satisfying lunches, and tasty dinners. 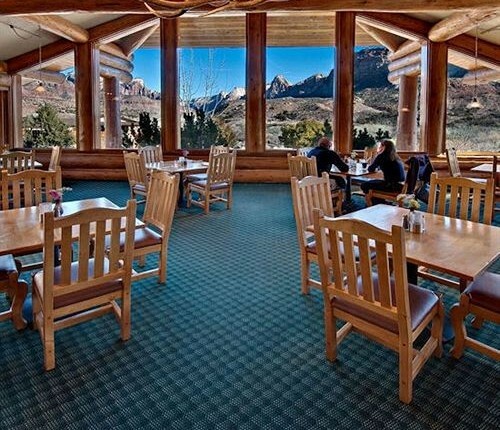 All with the best view in Southern Utah from Arkansas Al’s Steakhouse huge picture windows. Arkansas Al’s Steakhouse breakfasts range from traditional American ham and eggs, to cereal, fruit and croissants, with fresh coffee and a variety of juices. Arkansas Al’s Steakhouse lunch menu has great burgers, sandwiches, salads, appetizers and much more. All these can be accompanied by Arkansas Al’s Steakhouse fine selection of beers and wines on hand. For dinner choose from steak, seafood, pasta, chicken, and salads. We offer beer and an extensive wine list by the glass or bottle. Of course, all can be topped off with one of Arkansas Al’s Steakhouse great homemade desserts.